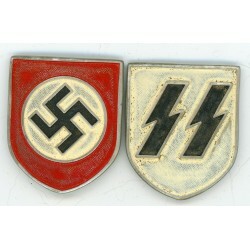 German Hat insignia There are 14 products. Skull from a soldier's cap M43. You are bidding WWII German Skull from SS cap M43 in a good condition. 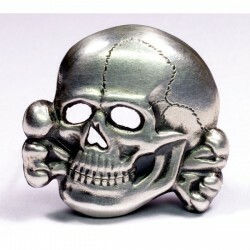 Dimension of the skull is 29 mm x 25 mm; weights – 7.67 grams. Skull made from solid silver with silver content mark inside 835. 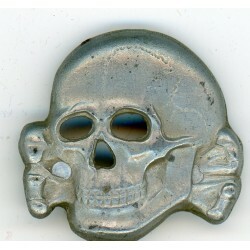 You are bidding WWII German Skull from SS cap M43 reproduction in a good condition. Dimension of the skull is 29 mm x 28 mm. Skull made from white metal. 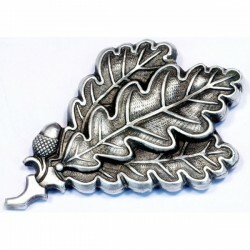 World War Two Period Jaeger Troops Hat Oak Leaves Acorns Badge Insignia. 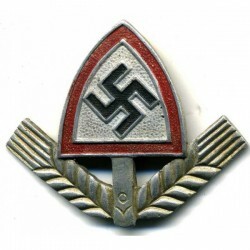 Mountain Troops OFFICERS Hat Edelweiss Badge. Eagle and skull from a military cap. 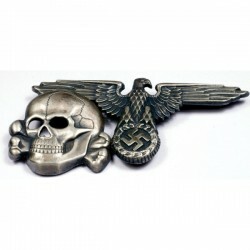 You are bidding Eagle and skull from SS cap. 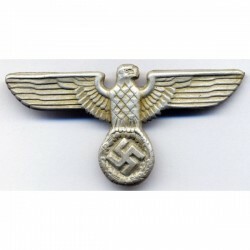 GERMAN LUFTWAFFE VISOR CAP EAGLE. 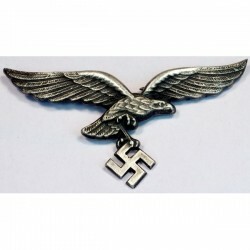 GERMAN NAZI LUFTWAFFE VISOR CAP EAGLE. WWII German Aluminum Army Visor Hat Eagle Insignia in a good condition. Circa 40ies of 20th centure.Consistent with its age, Please see scans! 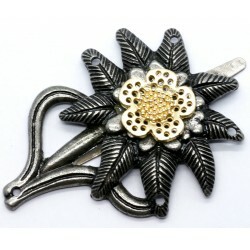 This is a two prong near mint eagle for the visor hat. Dimensions – apprx. 63 mm x 32 mm. The pictures are from actual item that you will recieve. WW II Wafen unit German Tropical hat Insigniain a good condition. Circa 40ies of 20th centure.Consistent with its age, Please see scans! Marked with Makers marks RZM. Dimensions – apprx. 40 mm x 35 mm. Material – aluminum. The pictures are from actual item that you will recieve. 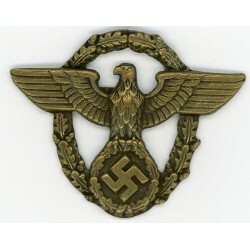 WWII German Police`s Hat Eagle Insignia in a good condition- reproduction. Please see scans! 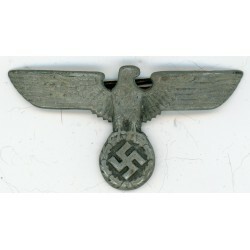 This is a soldier's vizor cap badge,. Dimensions – apprx. 42 mm x 52 mm. Material -brass. The pictures are from actual item that you will recieve. 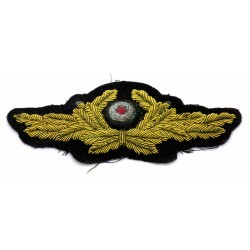 WW2 German Diplomatic General Officers Visor Hat Cap Wreath Cockade Insignia in a good condition; original. 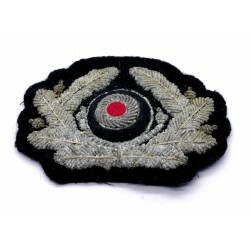 The insignia is made of gold cellion thread. Gold cellion thread is sharper and allows for clearer detail. Dimensions:12,0 cm x 4,6 cm Conditions:use The pictures are from actual item that you will recieve. WWII German army Elite Edelweiss Mountain Troops Hat Cap Cockade in a good condition.Reproduction. Developing time - around late 20th century .Consistent with its age,please see scans! Dimensions – apprx. 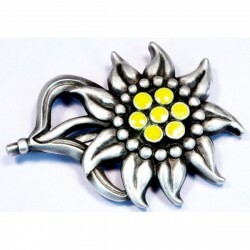 60mm x 40 mm Material – white metal. The pictures are from actual item that you will receive.